Your listeners will be able to tune in through almost any media player, such as Windows Media Player, Winamp, iTunes and Quicktime Player to name a few. Choose any plan on our "Premium Network" and instantly get 30% off! We make it easy to broadcast your own Internet radio station. 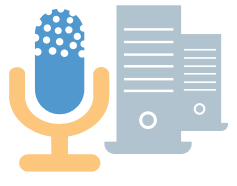 Software must support either Shoutcast or Icecast technologies. 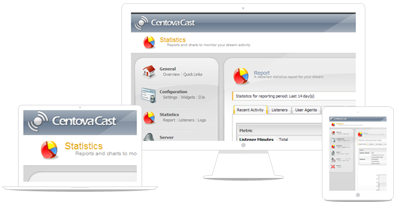 You control all aspects of your SHOUTcast or IceCast-KH streaming server using the CentovaCast Control Panel, which provides detailed statistical information about your station & your listeners, along with many other powerful features. Perfect for new & hobby stations that need to keep costs to a minimum. Your station will be allowed to burst to full capacity for short periods of time. Geared up for popular & professional stations that need the high capacity, maximum uptime and the best bandwidth quality on the market. Signup online and your account will be instantly created. A confirmation e-mail will be sent to you which will include a link to the control panel. We offer free assistance to get your station setup. If necessary, you can share your screen with a tech so they can remotely configure your computer.